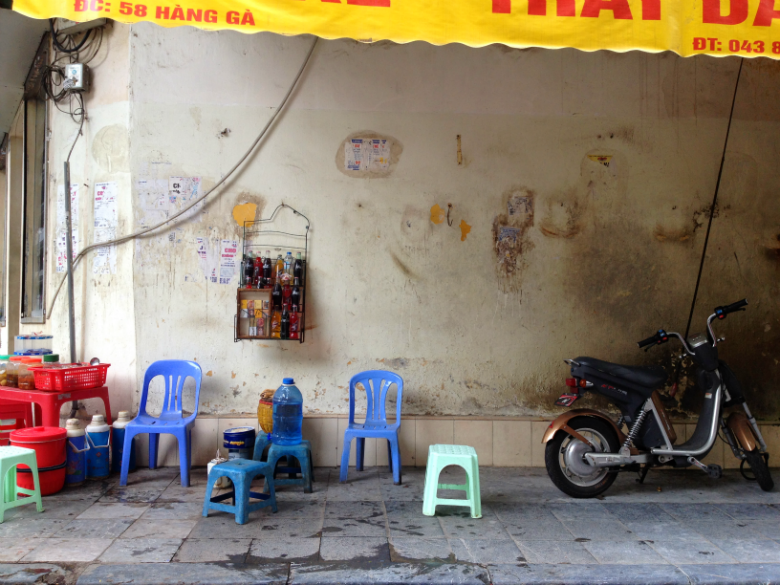 Hanoi is pitted as an eating city. Tales of street food and gallons of pho are not uncommon from past visitors to the bustling northern Vietnamese hub, but how easy is it to eat the authentic food of Hanoi? Is it so well trodden on the tourist train that foreigners can only taste a snippet of the array of deliciousness out there? It turns out there is plenty of food on offer all over the place. Vietnam may seem to some outsiders as a developing country, and in many ways it is, but it continues to evolve and build upon its strong culture and depth of history. Lest we forget that Vietnam has its own MTV channel. This is a country with vibrant, future-driven, up-and-coming youth scene with a massive food offering to match. 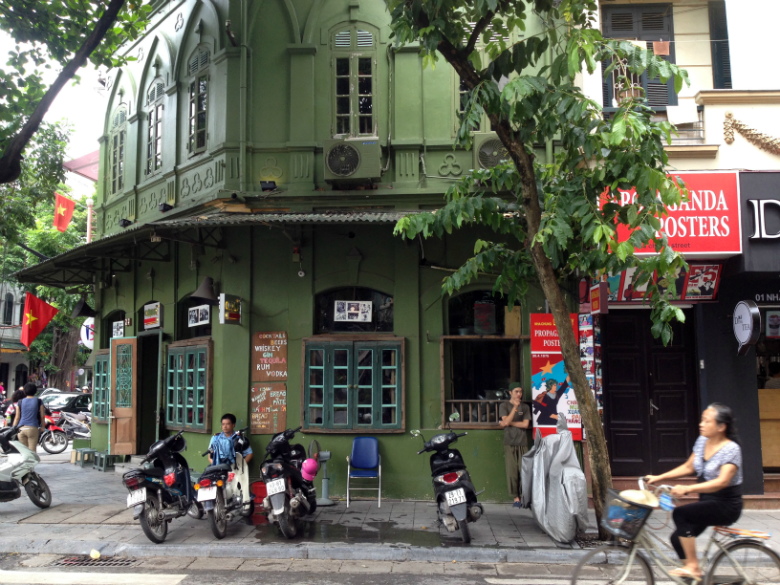 Hanoi, with its layers of French-infused history, culture derived from Chinese cousins and everlasting revolutionary spirit not only spills over with the old-town-plastic-stool street food, but also a popping spectrum of fashionable high-end dining and chic, style orientated bars and coffee shops. Dig in and get eating. This is a city as delicious for the palate as it is for the eyes. 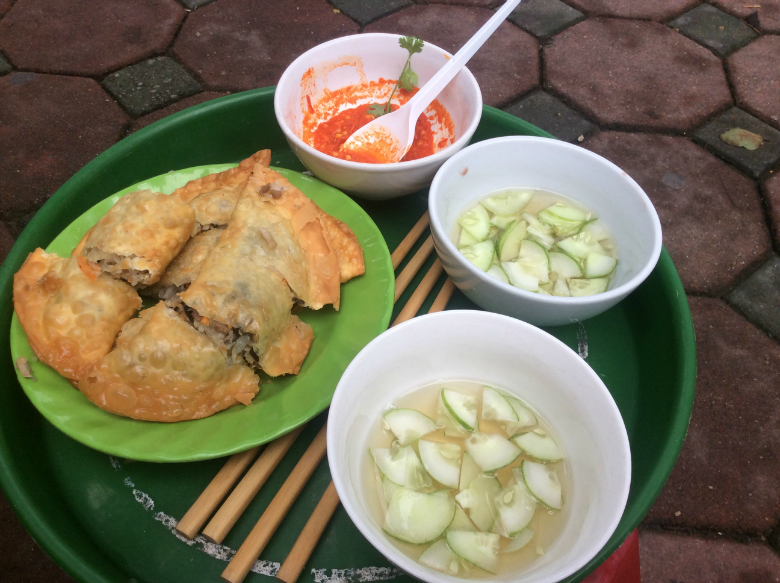 It's not always easy being a vegetarian and wanting to sample street food in Vietnam—there is often a language barrier and it's hard to know what exactly the food is that you will be served up, let alone if it is vegetarian or not. A little searching online bought up this place, with an enthusiastic review by a guy who got chatting to the owners and found out it was run by a Buddhist family who are all vegetarian. 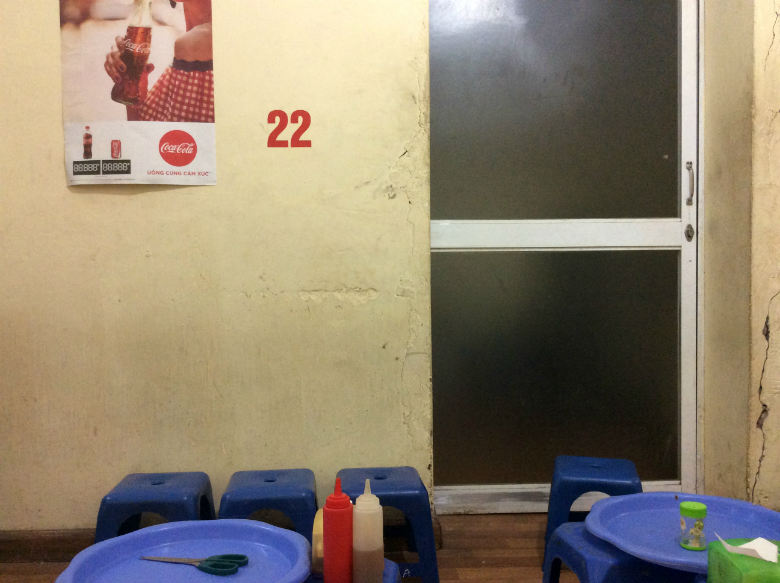 We headed for some food at this hidden gem of a vegetarian (chay in Vietnamese) food stall after our visit to the Women's Museum which is not too far away. On finding the stall we tentatively approached one of the ladies who was busy serving up food. She greeted us with a smile and kindly helped us make our food choice, aided with a bit of pointing at what other people were eating. 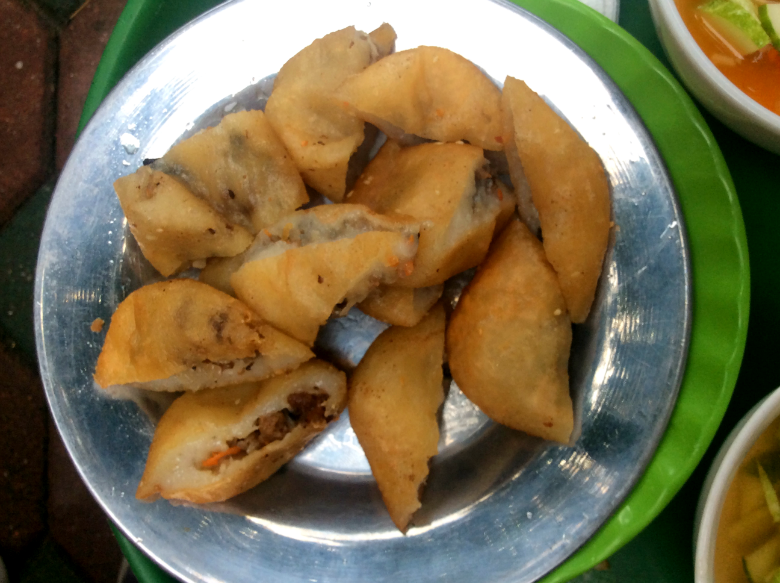 We took a stall alongside office workers who were getting a snack with friends after a long day, groups of ladies and men in suits enjoying the simple yet delicious sort of Vietnamese take on empanadas. Stuffed with mushrooms, noodles and other tasty bits, these deep fried crescent moon pasties were packed with a delicate but stodgy filling, served with a light sweet clear soup with cucumber bobbing around in it. We watched the locals dip their deep fried treats into this spicy nước chấm dip to add seasoning before biting into them. 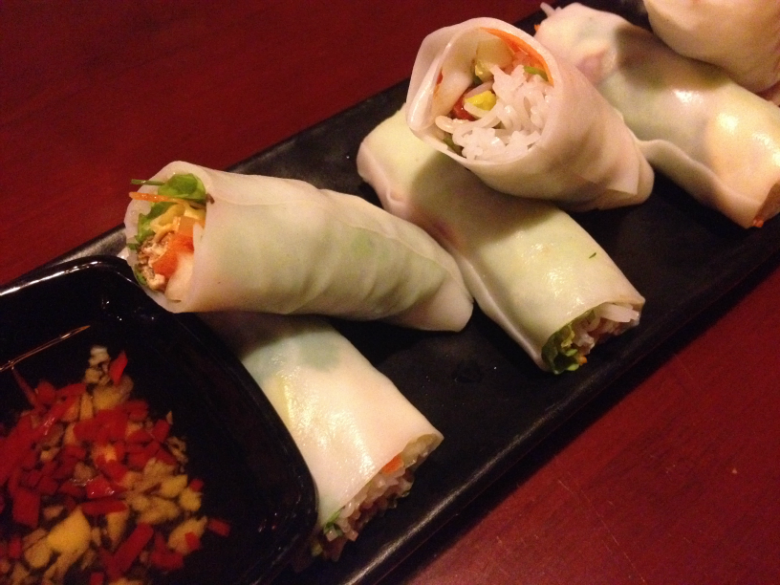 The bánh gối, as we discovered they are called, were deliciously moreish and our Western appetite craved more the moment we finished, embarrassingly quickly. They also sold bánh rán mặn, a deep-fried savoury ball with a savoury filling, so after plucking up the courage to greedily ask for more food we devoured the bouncy chewiness of the terribly unhealthy doughnut. What a place—and all that incredible food for a pound or two. 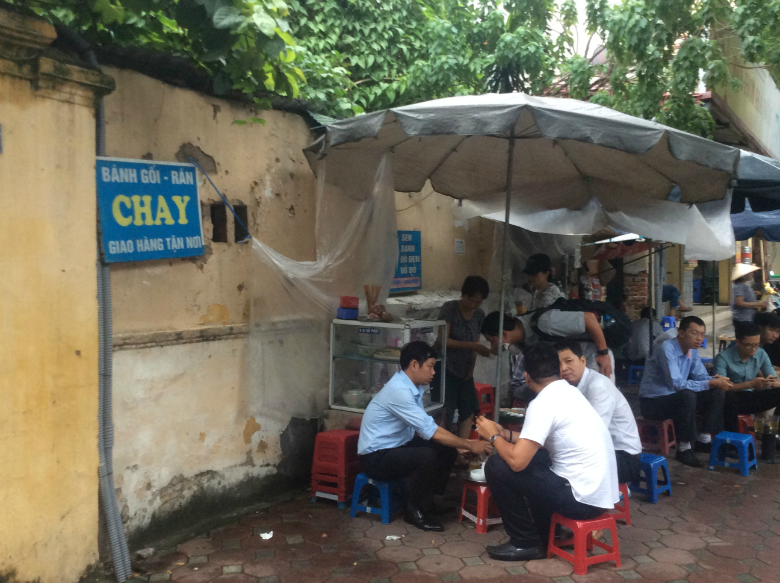 Hanoi street-food at its best: chay and tasty. A laid-back sultry feel seeps through the dark wood and thought-out design elements that epitomise the vibes of this bar. 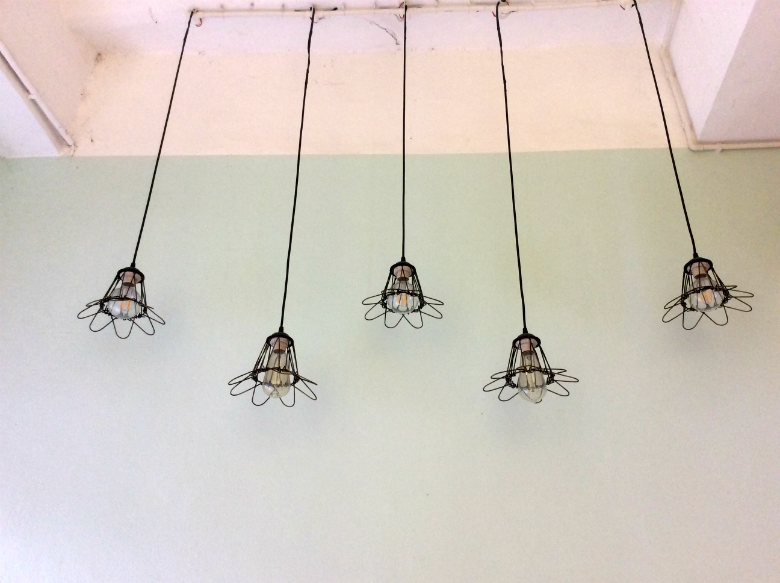 Step through the doors away from the motorbike-laden lanes and into an oozy dark atmosphere of vintage aesthetic that feels part-Chinese shophouse cafe, part-East London pub. It was a tropical musky rainy night when we visited for dinner, but we made the twenty minute walk from our hotel after reading about Hanoi Social Club's reputation online. Inside, a few people lounged around in various corners, chilling and chatting with friends. An American family played board games together around a table. 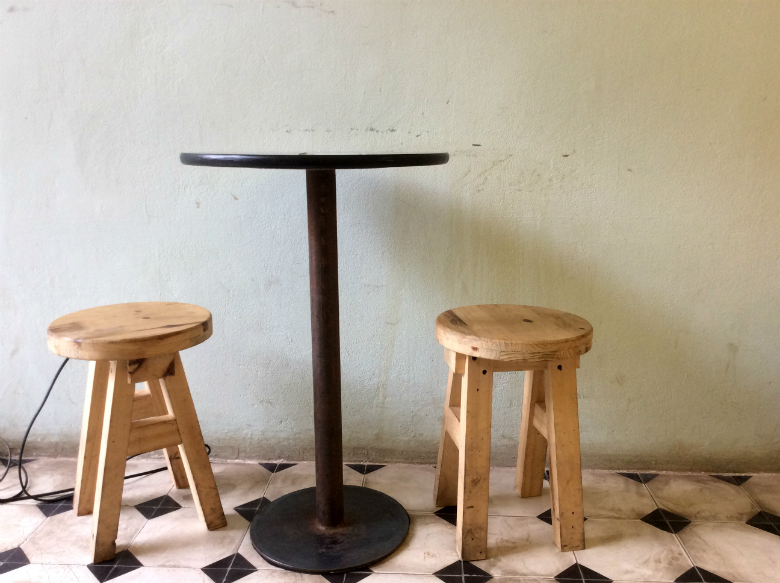 We ordered our food and sat and sipped our cold Hanoi beer, wooed by the cultivation of creative furnishings and old tiled floors. The food was a comforting memory of home. 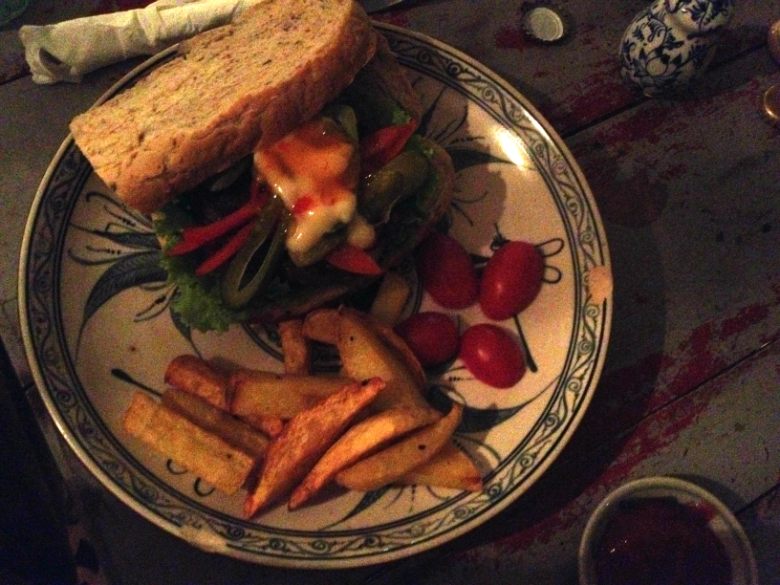 We greedily scoffed down a veggie burger that came on fresh granary bread and served with home cooked chips, plus some gỏi cuốn (summer rolls) to share. 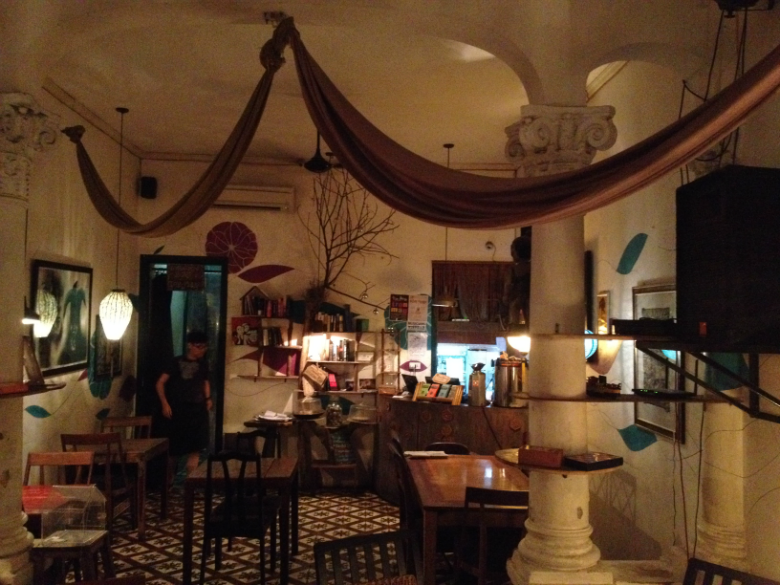 Hanoi social club is the place to come for a bubble of comfort and chill. 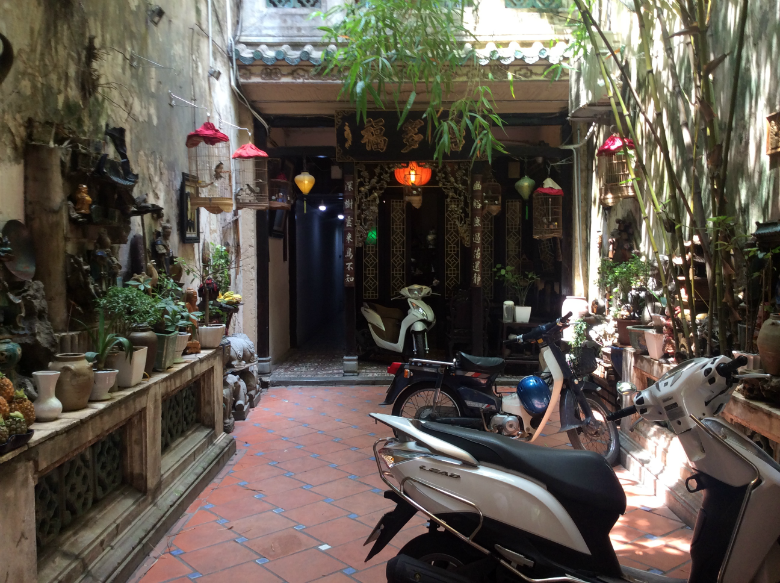 Hidden down a higgeldy-piggeldy backstreet in Hanoi, adjacent to the right side of the St Joseph Cathedral is the vegetarian restaurant Mihn Chay. 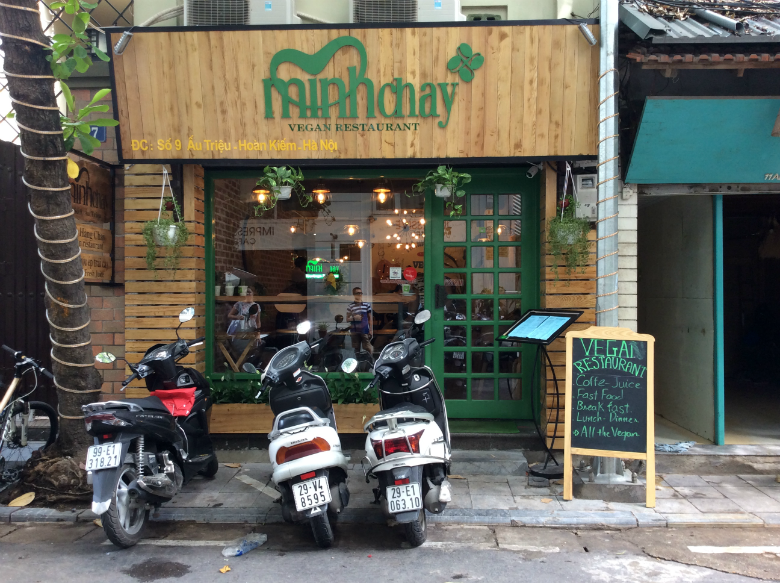 Quaintly furnished with a natural theme, Minh Chay serves up a tasty catalogue of vegetarian Vietnamese and western dishes. 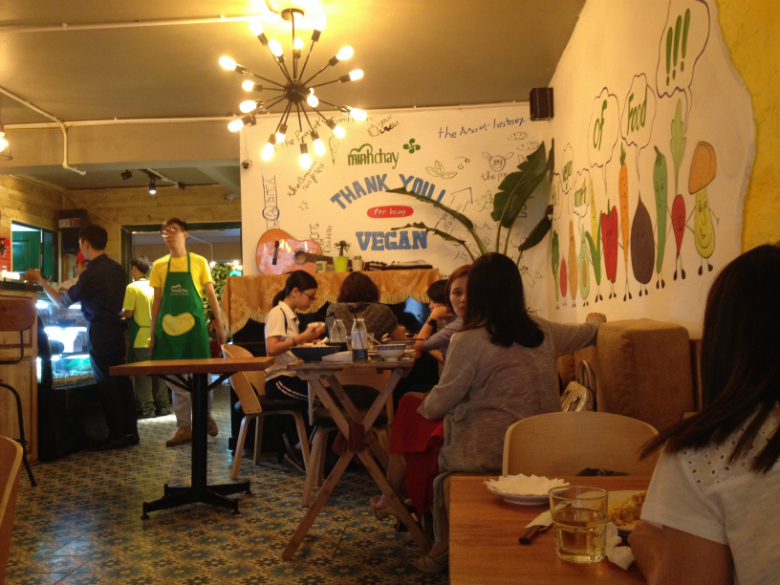 The surroundings are peaceful and clean with a fresh, trendy vibe reminiscent of a vegetarian eatery in London's Soho. 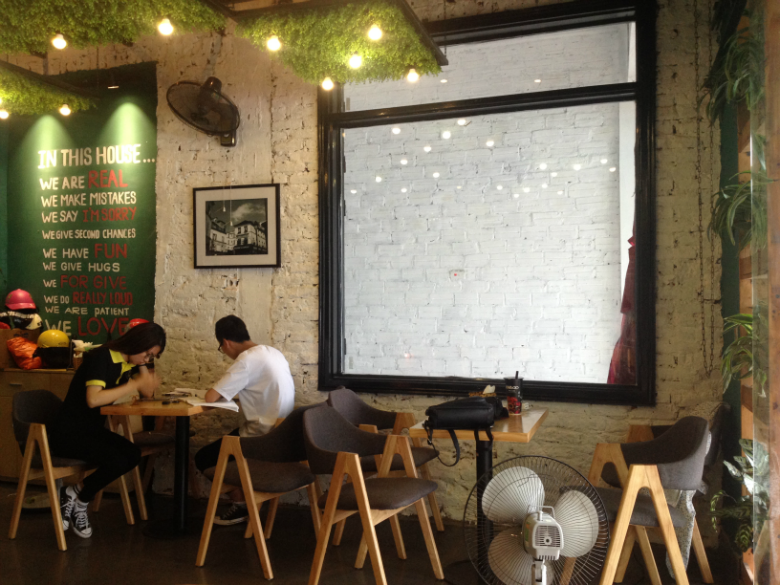 The staff are friendly and attentive and there's the buzzing chat of Hanoi-ites grabbing a bite for lunch with friends and colleagues. It all adds up to a palatable atmosphere. 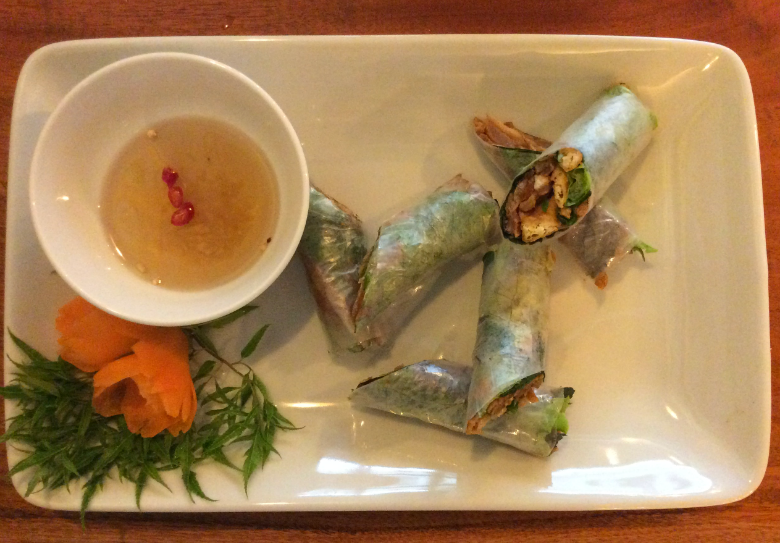 We've read that going vegetarian for a few token days here and there is a thing in Vietnam, which combined with underlying Buddhist traditions of abstinence from meat might explain why this place serves up such tasty meatless wonders. 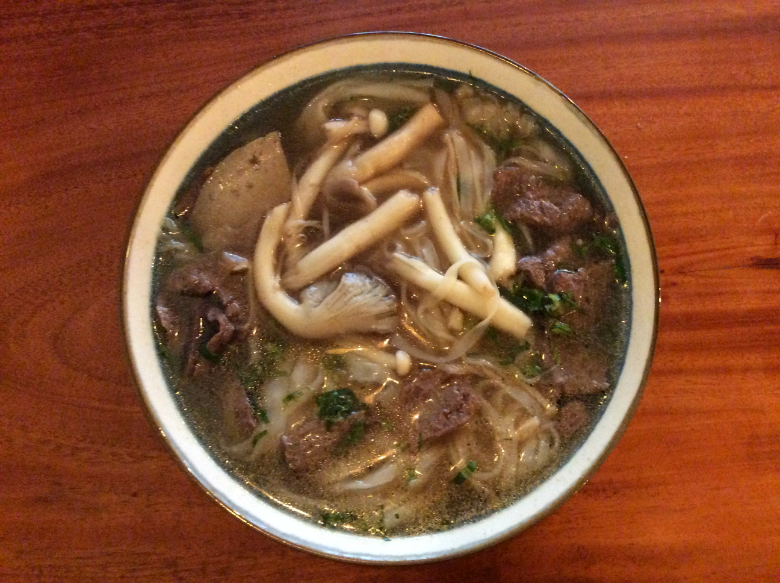 We ordered the pho which was our chance to try out the vegetarian version of a classic Vietnamese dish and it didn't disappoint; not too salty and with the a refreshing, aromatic depth. The mushrooms were meaty but not overpowering with mock meat soaking up flavour. The veggie burger exceeded expectation, it didn't even ooze out the sides, as many runners-up attempts in the world do, and was packed full of flavour with a delicious hearty texture. The serving of gỏi cuốn chay were the best we've eaten: delicate and fragrant, a big fresh crunch mixed with soft chewiness. 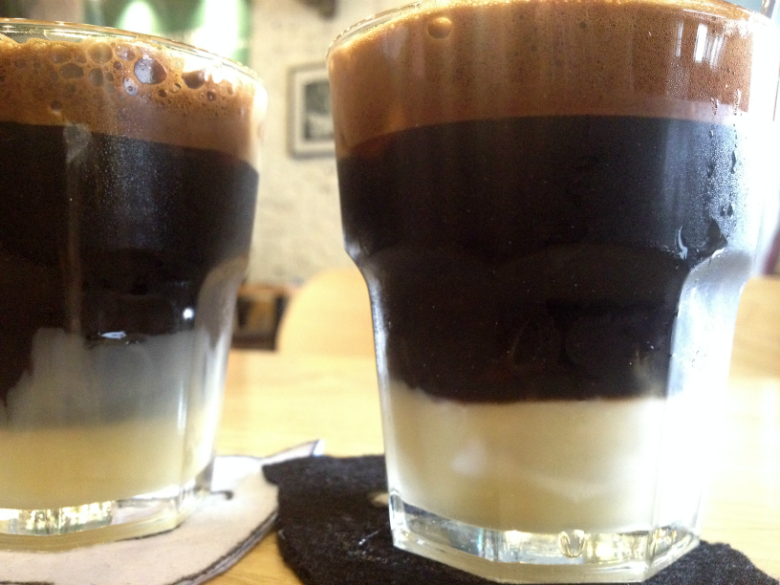 We ducked into Gemini Coffee to escape a tropical monsoon downpour one afternoon as we walked around Trúc Bạch Lake. The cafe was fairly quite with a few students hanging out together studying and texting. 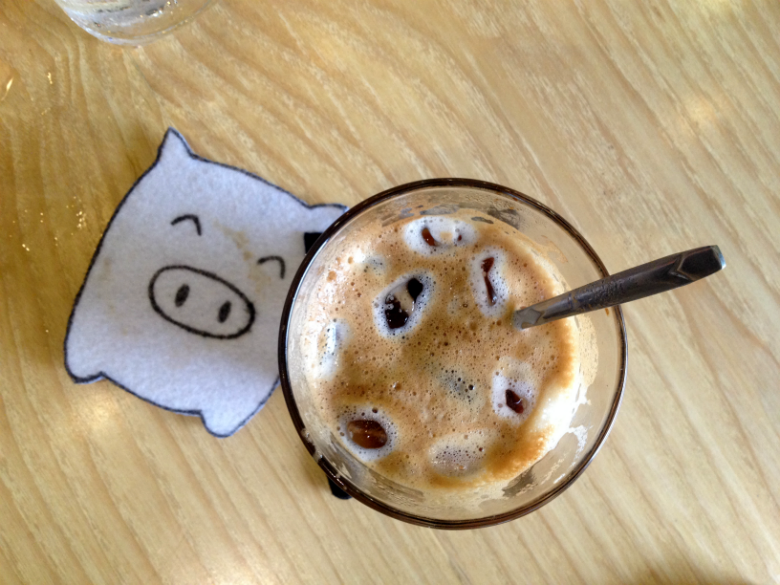 We were welcomed in out of the rain and served deliciously creamy iced coffee on cute animal coasters. We effortlessly sunk into the chilled vibes amongst the greenery, happy quotes on the wall and music playing from someones phone. 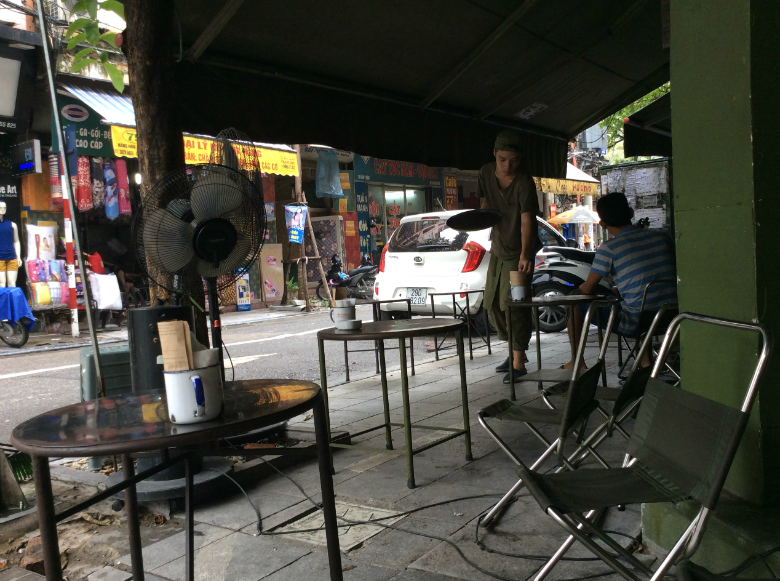 This low-key cafe is a calm spot for local students away from the tourist traps for a tasty coffee. 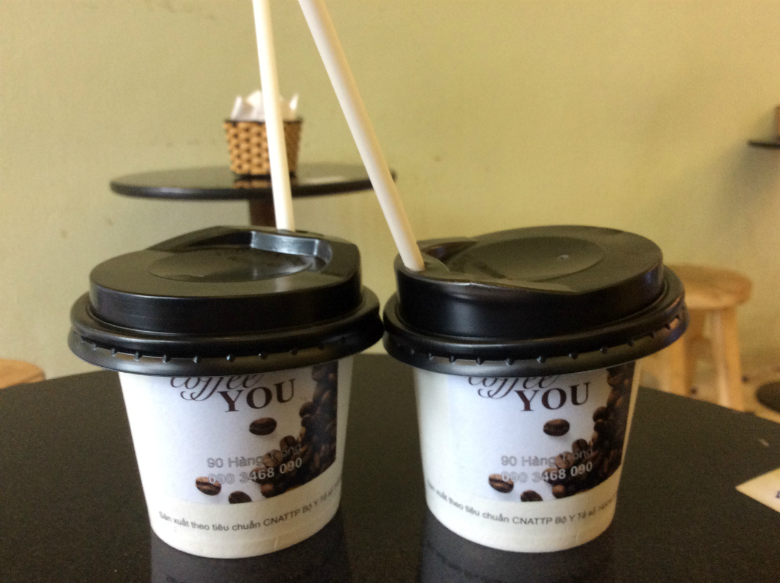 After arriving in Hanoi on an overnight train from the boarder town of Lao Cai we rocked up in Hanoi at 5am and in real need of a coffee. This was this first place we stumbled on once we had dropped our bags off at our hotel, it was open and wasn't charging crazy tourist prices. In the small slither of a cafe, we sat alongside a gradually arriving gang of lovely smiling older ladies who were all coming together for a Saturday morning meetup, basically to have a cup of good coffee and a gossip. 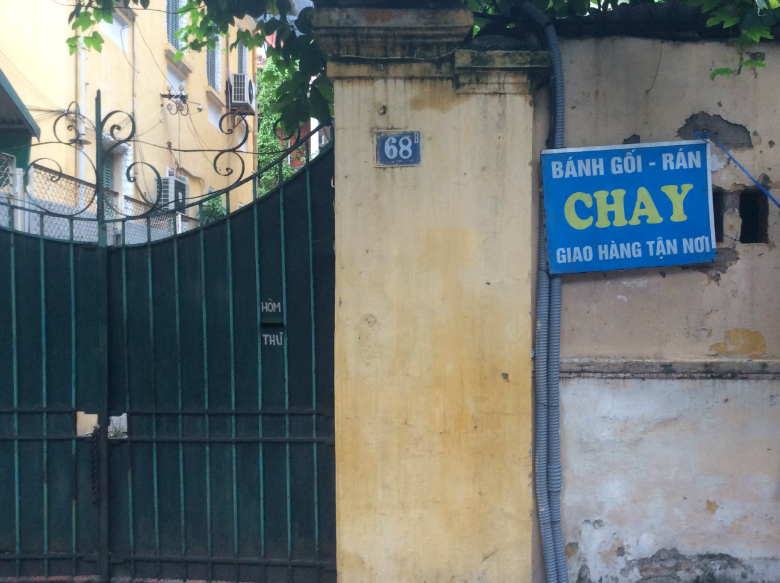 We couldn't help but wonder about all of the changes these ladies must have seen during their lives in Hanoi. The coffee from Cafe You hit the spot and the cafe itself was decorated in calming pastel colours with small wooden stalls to perch on. 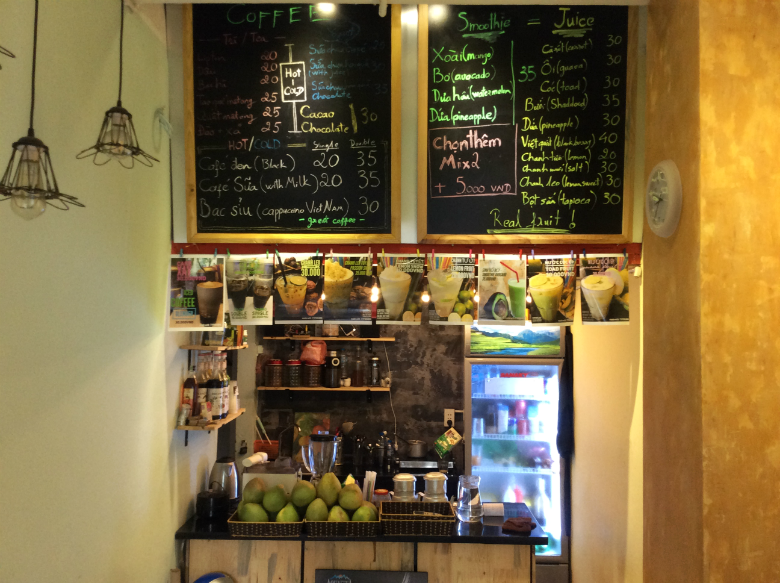 A really happy and welcoming place that would quickly become our regular if we lived in Hanoi! 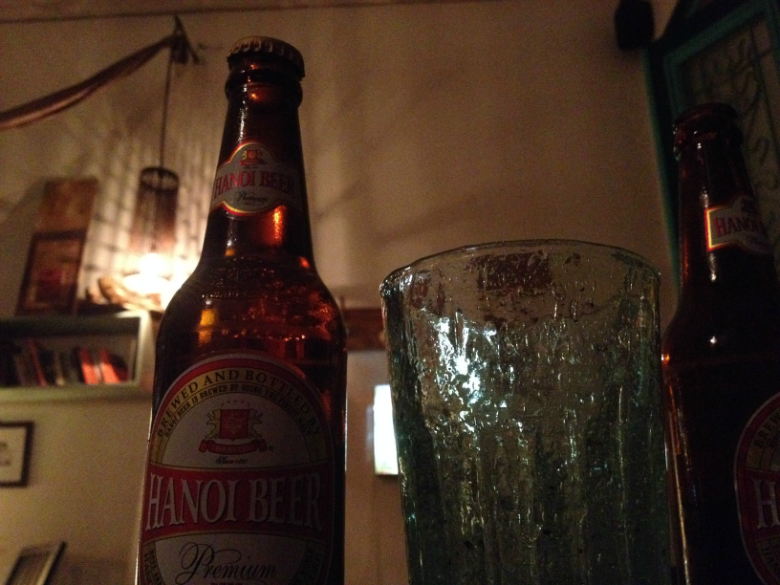 Oh what a wonder street food in Hanoi is. 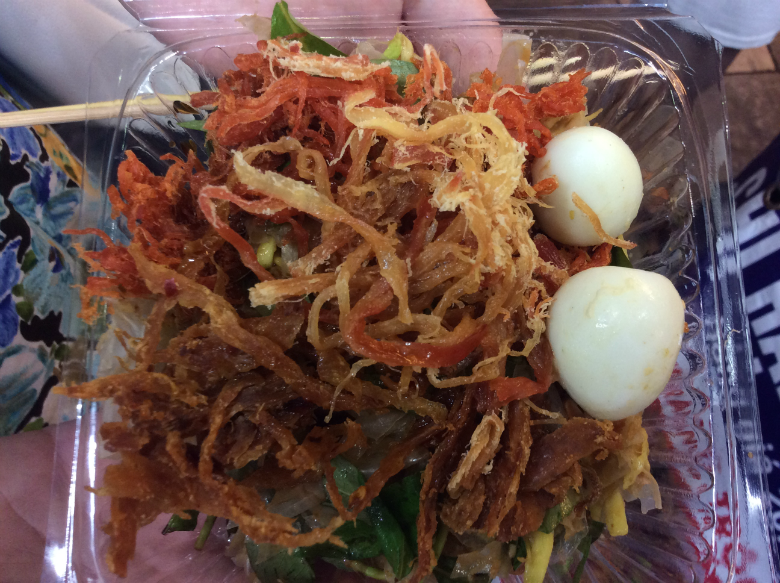 This dish was introduced to us by our new friend Sammi who showed us around the weekend night market in the old town. 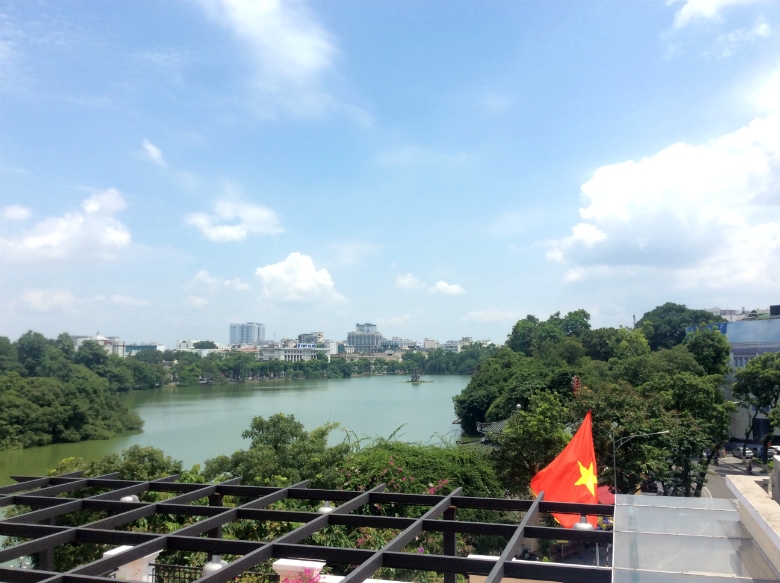 This place is definitely a tourist spot with its views over Hoàn Kiếm Lake and favourable write ups in various travel guides it was always bound to attract a load of westerners, but was "one of Hanoi's best-kept secrets" worth the visit? Well, it was actually an interesting place to go and sip on a refreshing iced coffee. Pho Co was more that hard to find, we tried a few different doorways to find the entrance. Eventually we were pointed in the right direction by a friendly shop owner who seemed like she spent all day directing clueless foreigners to the cafe. 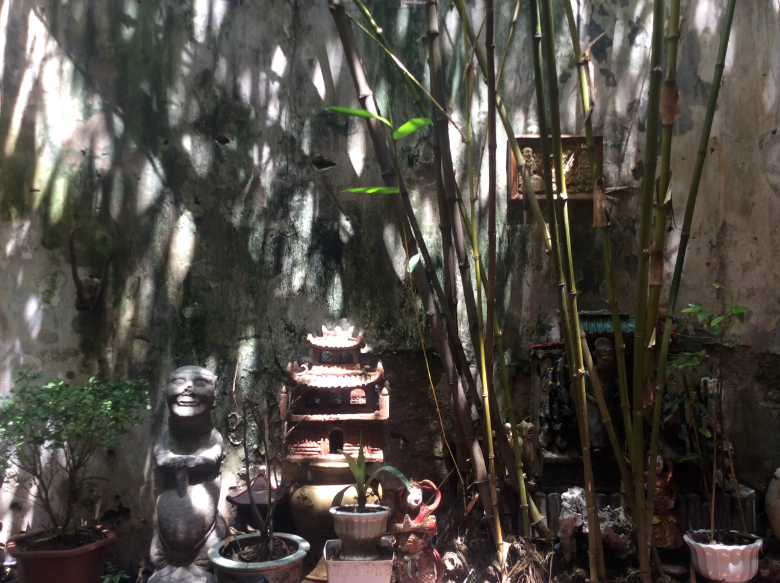 We made our cautious way through the silk store, down a narrow alleyway, past someone's front door and out into a lush green paradise of a courtyard. 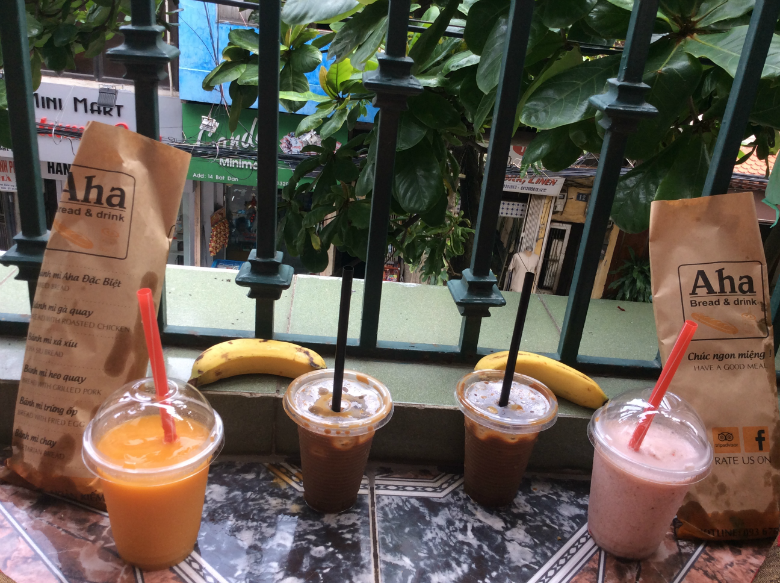 We placed our order for coffee and cake on the ground floor with two nonchalant girls and then made the climb up and up narrow flights of stairs to come out on the hot roof terrace. Locating and getting to this place had been half the experience. The whole place seemed like someone had hastily hit upon an idea to serve coffee to tourists from their home with a view and that was all. 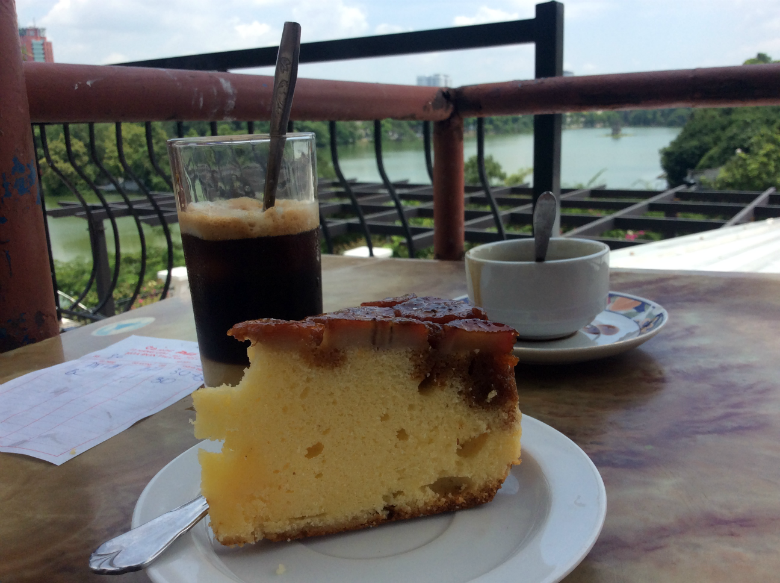 The coffee was nice enough and it was a treat to sample some fresh cake, but the selling point was the sight of the city from up high, the views of the Lake, and to get a perspective on where we were amongst the buzzy bubble of the old town. 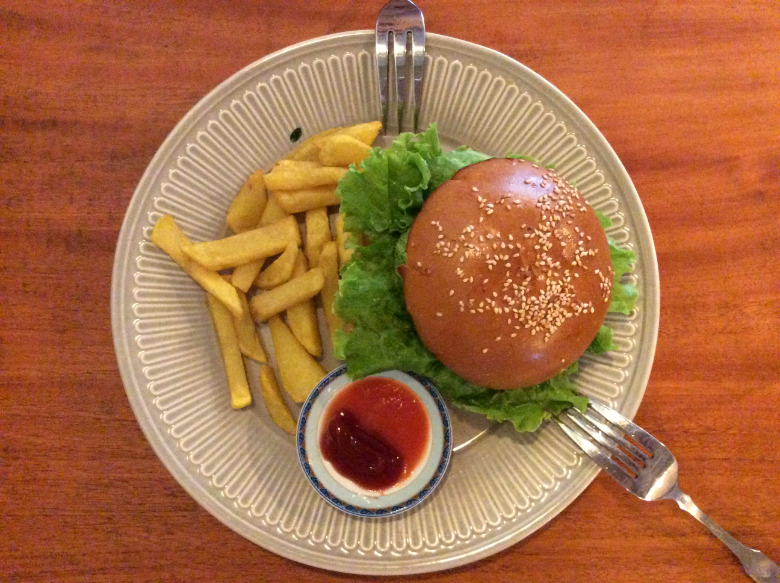 Undoubtedly in more than one top ten tourist guide to 'best banh mi in hanoi' or indeed 'top eats' of the city, Banh Mi 25 is suitably packed with Western diners, leading to a small lag in service, with space at the tiny but cute tables at a premium. More expensive than other purveyors of this breadular treat, the taste is certainly here and is very potent. There's even the tables come pre-blessed with sriracha sauce. 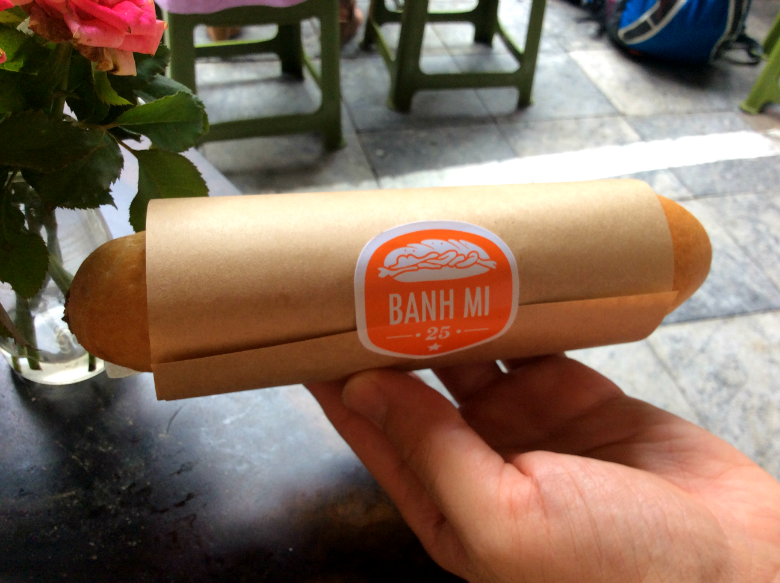 However, the size of these banh mi is somewhat disappointing; their small size also precludes a certain authenticity, with all other banh mi places selling non-small, similar-sized half-baguettes, sold in big bunches at dawn across the city's streets. Top marks for presentation and branding though. 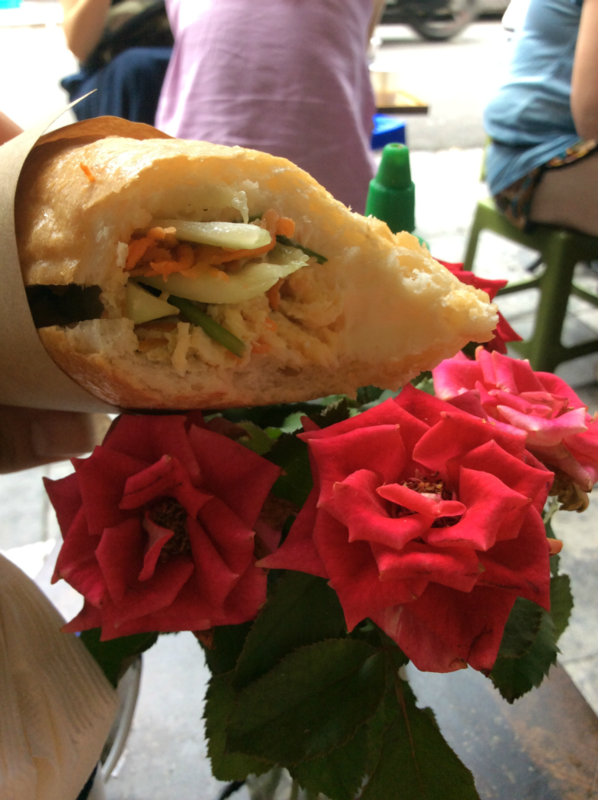 This is THE best banh mi we tried in all of Vietnam. Hot, fresh, very cheap and full of punchy flavour this banh mi stall is not to be over looked. We could not get enough for it and even ate it for breakfast on our birthday. The vegetarian egg banh mi was topped with enough coriander to add a zing to the perfectly fried eggs all spiced up with sweet chilli sauce. The traditional version with pâté and various juicy and just-a-little-bit-fatty sausage meat was just beautiful. The bread here was what made this place a winner, a hefty chunk of french bread stuffed full of tastiness. The staff are very friendly too and in the mornings they give you a free banana to top off your breakfast. 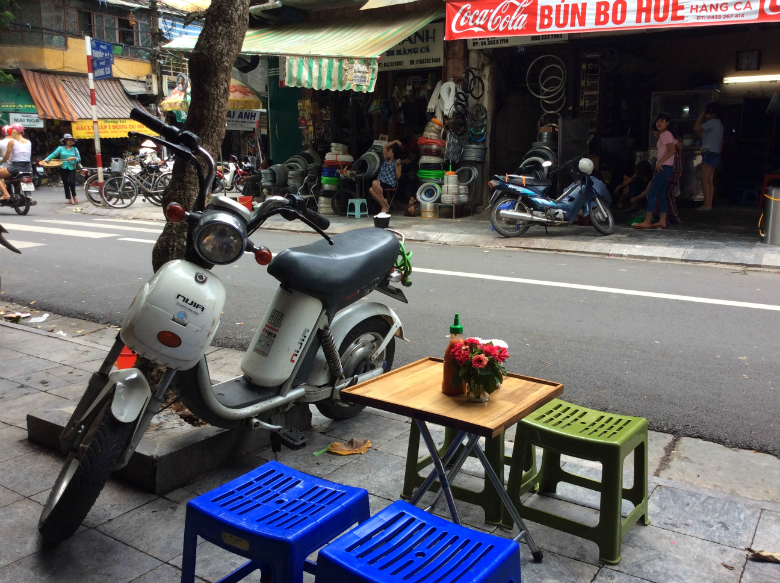 Take a seat at one of the little wooden stalls early in the morning alongside locals grabbing a bite on their way to work or late in the evening with a cold beer and watch the world of Hanoi whizz by and the daily routine of the city go through its motions. 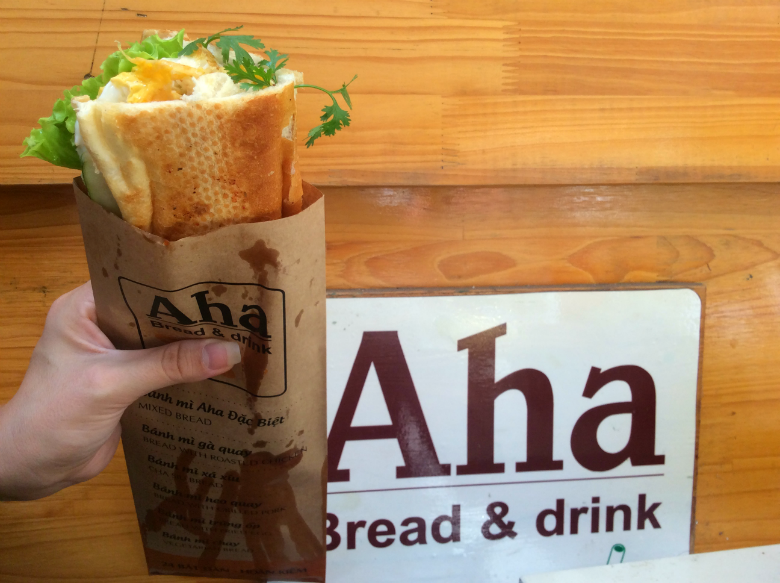 Why isn't there an Aha stall at the end of our road in London? WE REALLY NEED ONE! 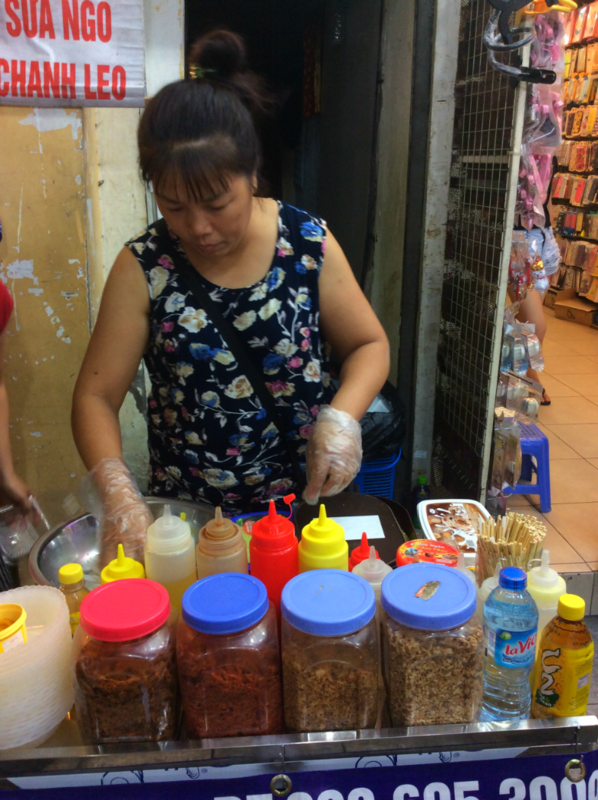 After being introduced us to the tasty heartiness of bánh tráng trộn by Sammi at the night market we went on the hunt to find it again. This place was really not expecting two Westeners to turn up but we did and it was awesome. Hidden up a dark, disappearing staircase, we arrived on the first floor of the building in a stripped-back barely decorated room with customary small plastic furniture for us to dine on. We managed to order the dish without meat or fish and sat in the rough charm alongside a young couple chatting together next to us. 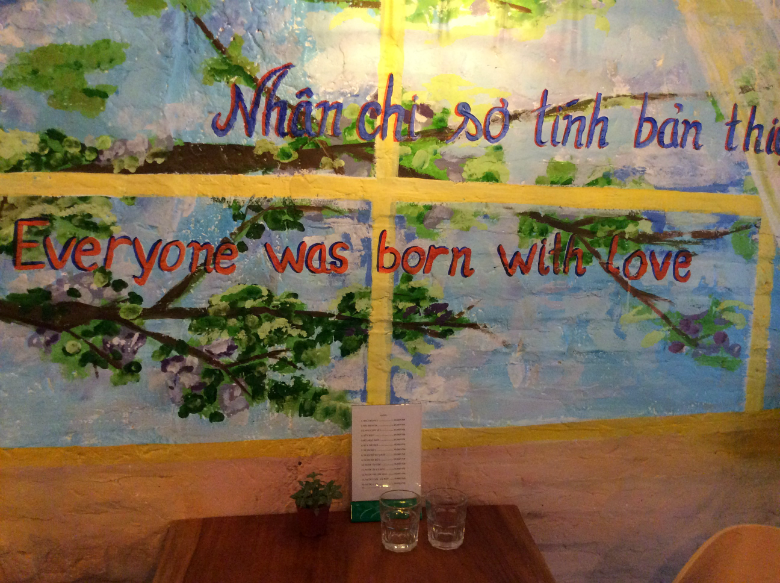 A youthful and stripped back restaurant, it is a place to find out where the young people of Hanoi eat away from the touristy side of the city. 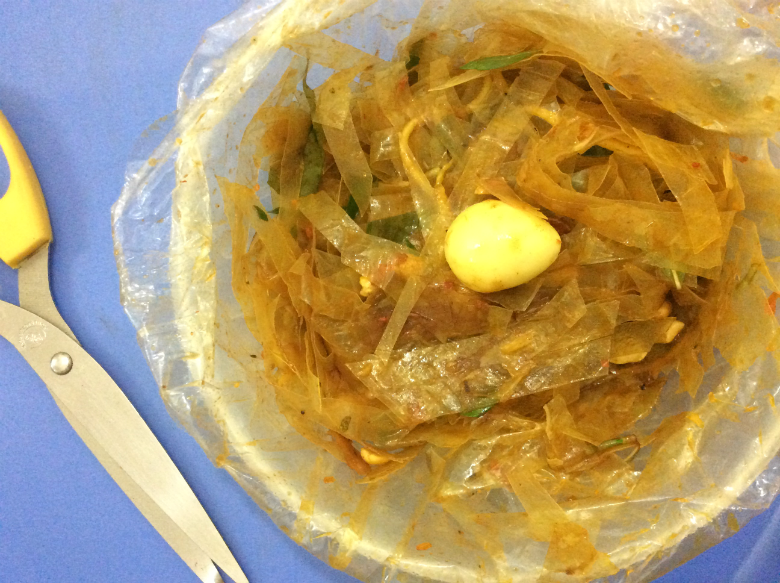 The bánh tráng trộn came mixed and served in a plastic bag placed over a bowl, the basic set up made it equally brilliant. We were handed a pair of scissors to cut up the noodles even more if we wanted to. All this tasty madness for no more than £1. 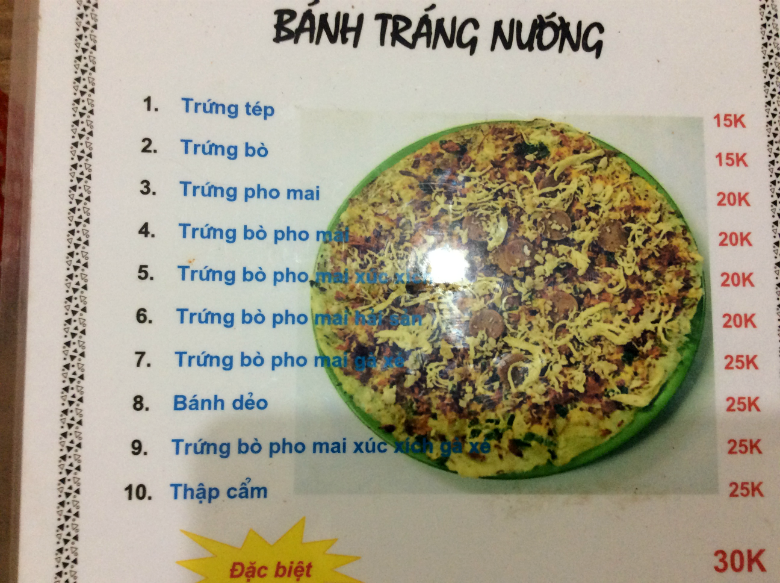 Our one true regret is not trying the quite splendid-looking long-distant relative of pizza, bánh tráng nướng. 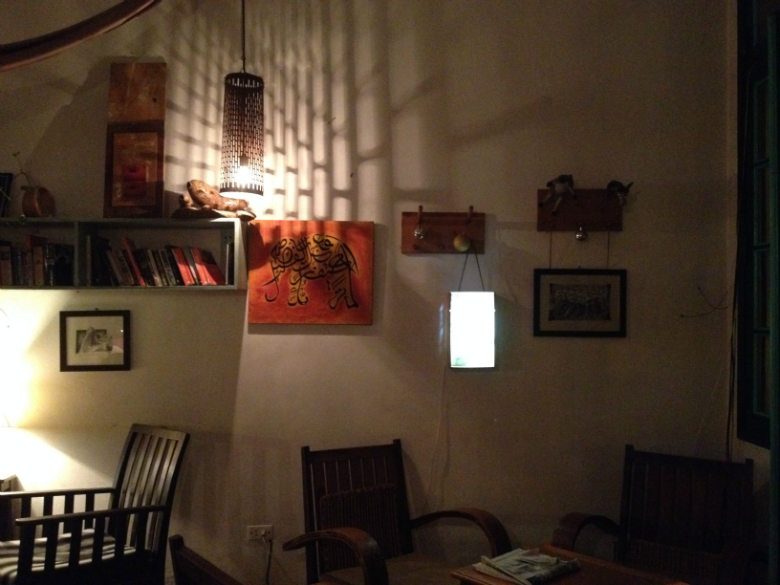 Dotted all over Hanoi Cong Caphe has nostalgically captured the spirit and aesthetic of the Viet Cong era. 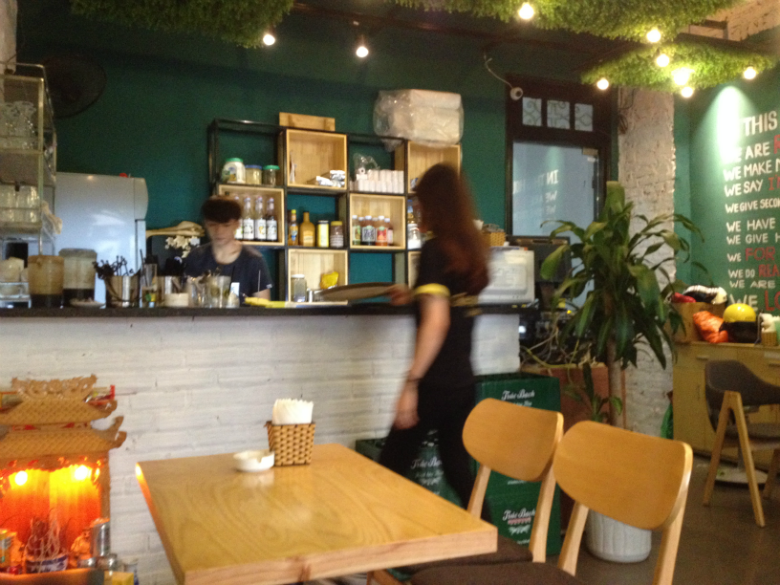 Knowingly designed with details that evoke the old times, staff are dressed in Viet Cong-style uniform, small chairs are covered in canvass and the whole colour theme is guerilla green. It's fun and a little shocking that this could be such a stylish backdrop for a more than popular hang-out. 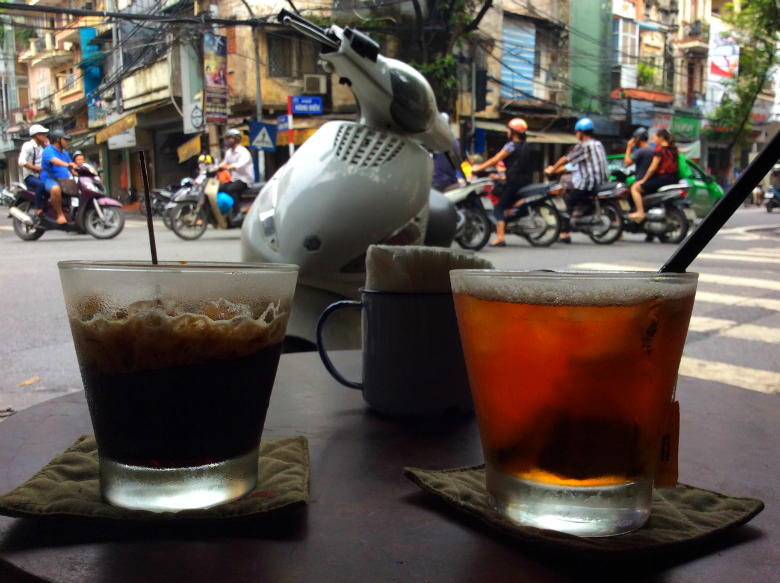 Locals and tourists can be spotted late into the night grabbing an iced coffee or Hanoi beer (food is served, but not all of the time). This one on a corner in the French quarter is perfectly situated for people-watching.